There’s a new book coming around, simply called A Disney Sketchbook. Edited by Ken Shue, it’s been getting considerable buzz prior to its release. 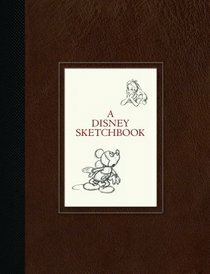 Here’s the publisher’s summary: “The Disney Sketchbook is a glorious, collectible coffee-table book showcasing the rich visual development art by Disney animators over the more than eighty-year history of the Walt Disney Animation Studios (originally Disney Feature Animation). The sketchbook appears as if Disney’s animation artists have passed it among each other through the years, from the early beginnings of the Studios’ work, through the present day. Frequently, current artists have drawn their concepts alongside earlier characters that have influenced their work. In brief but potent text, the current Disney animators will reflect on the inspiration of the artists who have preceded them, going back to the “first generation” of animators who created the Silly Symphonies and early cartoons, to the first Golden Age of Disney animation (Snow White to The Black Cauldron) to the present second Golden Age (The Little Mermaid onwards).” Harper Collins will release A Disney Sketchbook in hardcover on October 9th.